1. Air flow: 7 ~ 8 CFM. 2. Housing: thermoplastic PBT, UL94V-0. 3. 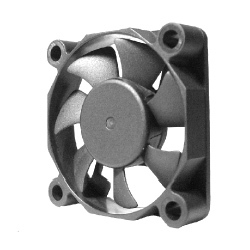 Impeller: thermoplastic PBT, UL94V-0. 4. Bearing: ball or sleeve. (1) Lead wire UL 2468 AWG#26 or equivalent. (2) Red wire positive (+); black wire negative (-). (3) Yellow wire function (3). 1. Operating temperature: (1) -10°C to +70°C for sleeve type. (2) -20°C to +80°C for ball type. 2. Weight: 14.7g.